﻿ Through the exchange experience, YFU students gain intercultural understanding, learn mutual respect, and develop a sense of social responsibility. Their experience abroad gives them leadership competencies necessary to meet the challenges and benefit from the opportunities of a fast-changing global community. YFU's history began very humbly in the United States in 1951 in an effort to heal the wounds of World War II. Understanding that the hardships prevalent in Germany after World War II were having devastating effects on the country's youth, placing them in a cycle of bitterness, hopelessness, and despair, American minister John Eberly made a proposal to church leaders. He asked to bring teenagers from war-torn Germany to the United States to live with a family and attend high school for a year. By teaching a group of young people how families lived together in the United States, the hope was that they would be motivated to go back to Germany and rebuild the country as a democracy, according to what they had observed while living in the United States. In 1951, 75 German teenagers from Germany and Austria were selected by the Army of the Occupation to come to live in the United States with American families for one year under the auspices of the US Department of State. The students selected were from the oldest age group not to have been part of the "Hitler Jugend" (the youth organization of the Nazi regime). The students were between 15 and 18 years old and, as it became apparent, this was exactly the age group which seemed to be most able to naturally participate and adjust to the lifestyles and values of a foreign family and community. Dr. Rachel Andresen, Executive Director of the Ann Arbor/Washtenaw Council of Churches, was asked (along with Rotary Districts in the southeastern part of Michigan) to lend her assistance and help place these first students in American homes on a voluntary basis. 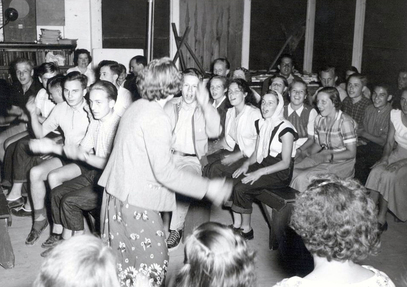 In 1952, the Council of Churches received permission to act as the official agency for the program, which they named "Youth For Understanding." Family and community living were at the center of the YFU international learning experience. Andresen served the program as Executive Director until she retired in 1973. Dr. Rachel Andresen was an extraordinarily charismatic leader of volunteers, first in Michigan, where she was born and raised, then throughout the world. Her vision, to build international understanding and world peace, was accomplished with the creation of YFU. Dr. Andresen’s work in the field of international youth exchange earned her a Nobel Peace Prize nomination in 1973. More information is available about Rachel’s story here. The selection and financing of the German students who came to Michigan during the early 1950’s was made possible through the US government. At that time, the role of YFU was to procure home placements and to provide supervision. The organization's offices were moved to Ann Arbor, Michigan, a university town located west of Detroit. In 1956, the US government funding was discontinued, but some transitional funds were made available as the US Department of State encouraged YFU to continue its work on a private basis. In 1955, the first American teenagers went to Europe during summer vacation for ten weeks. These students were placed in European families with the assistance of returned exchange students and their parents.